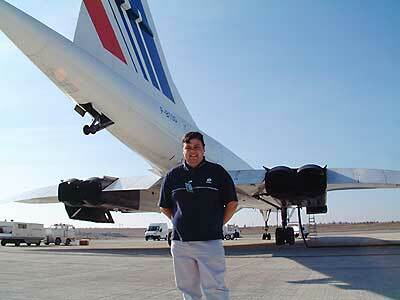 Thank you for vistiting my Concorde site, I hope the infomation was both useful and enjoyable. If you want to contact me with any suggestions, errors or if you have something you may like to contribute (Eg Info, Pics or to share your experiences) please e-mail me at the address below. On Saturday March 1st 2003 I was lucky enough to fly on a CDG-CDG "experience trip" on Concorde....Click here for the story. I will do my best to reply to most e-mails. For anyone interested: The picture was taken in September 2002 behind Air France Concorde F-BTSD during a visit to Vatry Airport, to the east of Paris, for crew training flights.